The Blue Monkey also referred to as the Cercopithecus mitis belong to the Old world monkey ancestry and thrives in the sections of East and Central Africa stretching from upper basin of River Congo to the East African Rift Valley and the north of Angola and Zambia to the south. It is one of the impressive primate species always encountered on Uganda safaris. 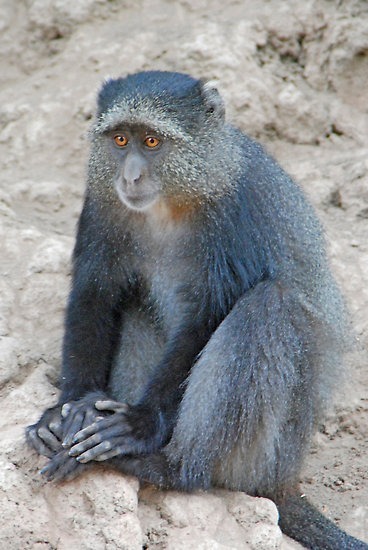 The Blue Monkey features a range of Sub species among which include; Cercopithecus mitis mitis, Cercopithecus mitis stuhlmanni, Cercopithecus mitis heymansi, Cercopithecus mitis elgonis, Cercopithecus mitis opitsthosticus, Stuhlmann’s blue monkey, Cercopithecus mitis botourlinii and Cercopithecus mitis schoutedeni. However, some of the listed have been given as full Species, some regarded as valid while others the respective authorities have declined to recognize them. Regarding the description, the Blue Monkey always encountered on safaris in Uganda is not all that blue as given by its name. The monkey features little hair on the face which at times provides it with a blue appearance. The Blue monkey is majorly olive or call it grey excluding the face which appears dark with yellowish patch on the forehead. It features a blackish feet, cap and front legs along with the mantle that appears brown, grey or olive according to the Sub species. The Blue monkey stretches from 50 to 65 cm in length excluding the tail which is as long as the entire animal. The females weigh about 4kg while males can stretch up to 8 kg. Regarding the habitat, the Blue monkey is located in ever green forests and the montane bamboo and thrives greatly in the forest canopy and rarely visits the ground as viewed on safari in Uganda. The Blue monkey greatly depends on humid and shady trees that feature water plenty. It majorly consumes leaves and fruit and at times takes on slow moving invertebrates. Regarding the social structure, it can be notes that Blue Monkeys thrive in female-philopatric social complexes where by the female monkeys would keep in their natal groupings while the males depart their natal grouping after attaining maturity. The Blue monkey groups tend to comprise of one male with a range of infants and females thus causing the formation of the matrilinear societies. At times the solitary males can be viewed in the search process for a new grouping. Regarding the social setting, the female bonded arrangements, the 5 – 15% of their time of comprised of interactions and the activities involved include playing and grooming. The relationships among the group members might vary and the infants tend to greatly socialize with the peers along with juvenile or adult females and are rarely viewed close to mature males as can be encountered on Uganda safari. The Blue Monkey features a lot of alloparenting where the infants are mostly handled by the juveniles and one infant can be cared for by a range of alloparents and this gives an infant the opportunity to learn socializing even at a basic age. It can also be noted that the relationships among the females thrive amongst the blue monkeys. This relationship is majorly shaped by the feeding ecology and in turn by intra and inter-group competition. The females of the Blue Monkey extend strong and aggressive competition amongst groups and between other Species as a result of territorial character though it not apparent within the group. Members with in the group feed at distance between one another thus desisting from competition. Regarding the reproduction, the mating system of the Blue Monkeys is polygynous and they feature sexual dimorphism where the males are larger in size. The female Blue Monkeys would give birth after two years mainly at the start of the warm rainy season. They feature a gestation period of about 5 months and the infants are born with fur along with their eyes open. The group sizes are 10 – 40 featuring a single mature male. They can co –exist along with the red colobus monkey and red tailed monkey. In Uganda, the Blue monkeys are more apparent in Kibale National Park whose concentration of primate species have always inspired travelers from various parts of the world to plan primate safaris to Uganda.